شوبی, پیمان, مهبادی, حسین, آدامیان, آرمن. (1396). تحلیل جریان سیال غیرنیوتنی در لوله مخروطی همگرا با استفاده از مدل بینگهام. نشریه پژوهشی مهندسی مکانیک ایران, 19(4), 6-17. پیمان شوبی; حسین مهبادی; آرمن آدامیان. "تحلیل جریان سیال غیرنیوتنی در لوله مخروطی همگرا با استفاده از مدل بینگهام". نشریه پژوهشی مهندسی مکانیک ایران, 19, 4, 1396, 6-17. شوبی, پیمان, مهبادی, حسین, آدامیان, آرمن. (1396). 'تحلیل جریان سیال غیرنیوتنی در لوله مخروطی همگرا با استفاده از مدل بینگهام', نشریه پژوهشی مهندسی مکانیک ایران, 19(4), pp. 6-17. شوبی, پیمان, مهبادی, حسین, آدامیان, آرمن. تحلیل جریان سیال غیرنیوتنی در لوله مخروطی همگرا با استفاده از مدل بینگهام. 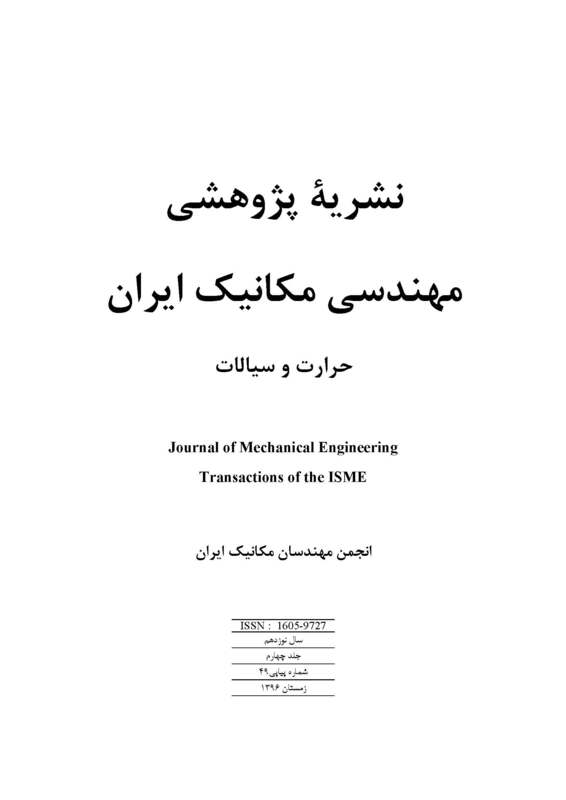 نشریه پژوهشی مهندسی مکانیک ایران, 1396; 19(4): 6-17. Fusi, L., Farina, A., and Rosso, F., "Flow of a Bingham-like Fluid in a Finite Channel of Varying Width: A Two-scale Approach", Journal of Non-newtonian Fluid Mechanics, Vols. 177-178, pp. 76-88, (2012). Frigaarda, I., and Ryanb, D., "Flow of a Visco-plastic Fluid in a Channel of Slowly Varying Width, Journal of Non-newtonian Fluid Mechanics", Vol. 123, pp. 67-83, (2004). Gupta, R. C., "Developing Bingham Fluid Flow in Channel", Mathematical Computer Modelling, Vol. 21, pp. 21-28, (1995). Chemloul, N. S., "Analytical Study of Bingham Fluid Flow Through a Conical Tube, Mechanika", Vol. 19, pp. 665-670, (2013). Avinash, K., Rao, J., Kumar, Y., and Sreenadh, Bingham S., "Fluid Flow through a Tapered Tube with Permeable Wall", Journal of Applied Fluid Mechanics, Vol. 6, pp. 143-148, (2013). Kemblowski, Z., and Kiljanski, T., "Flow of Stokesian Fluids Through Conical Ducts", Chemical Engineering Journal, Vol. 9, pp. 141-151, (1975). Walicki, E., and Walicka, A., "Pressure Drops in Conical Flow", Solidification of Metals and Alloys, Vol. 24, pp. 147-154, (1995). Lipscomb, G., and Denn, M., "Flow of Bingham Fluids in Complex Geometries", Journal of Non-newtonian Fluid Mechanics, Vol. 14, pp. 337-346, (1984). How, T., Black, R., and Annis, D., "Comparison of Pressure Losses in Steady Non-Newtonian Flow through Experimental Tapered and Cylindrical Arterial Prostheses", J. Biomed. Eng., Vol. 10, pp. 225-230, (1987). Dorier, C., and Tichy, J., "Behavior of a Bingham-like Viscous Fluid, Journal of Non-Newtonian Fluid Mechanics", Vol. 45, pp. 291-310, (1992). Oliveira, G., Rocha, L., Franco, A., and Negrao, C., "Numerical Simulation of the Start-up of Bingham Fluid Flows in Pipelines", Journal of Non-newtonian Fluid Mechanics, Vol. 165, pp. 1114-1128, (2010). Huilgol, R., and You, Z., "Application of the Augmented Lagrangian Method to Steady Pipe Flows", Journal of Non-newtonian Fluid Mechanics, Vol. 128, pp. 126-143, (2005). Ponalagusamyn, R., Selvi, R., and Banerjee, A.K., "Mathematical Model of Pulsatile Flow of Non-newtonian Fluid in Tubes of Varying Cross-sections and its Implications to Blood Flow", Journal of Franklin Institute, Vol. 349, pp. 1681-1698, (2012).